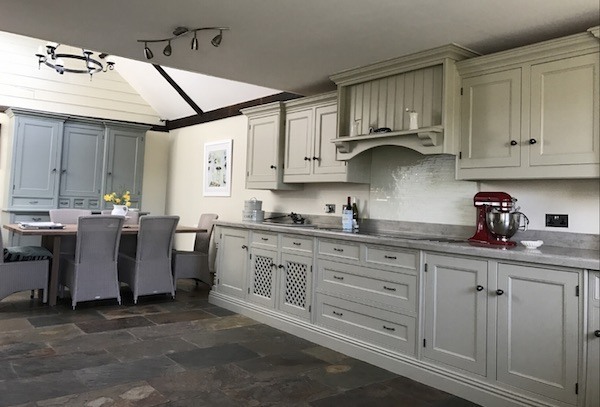 Richard Willott, Traditional Painter for Suffolk and Norfolk, was asked to repaint a wooden kitchen in Shotesham All Saints Norfolk, near Caistor St Edmund. Alternative title! What have the Romans ever done for us? There is a rich Roman and Anglo-Saxon history in East Anglia. 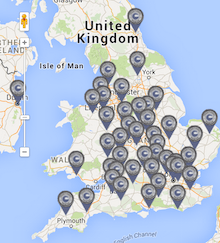 St Edmund features on the Antonine Itinerary, a Roman “road map” of the routes around Britain. As many of you may recall, in a Monty Python sketch from The Life of Brian, the revolutionaries posed the question, What have the Romans ever done for us? Their followers proceeded to list several monumental achievements such as roads and aquaducts and irrigation… Apart from failing to mention the Romans’ pioneering work with concrete, it was accurate info! Fast forward, the Angles moved in when the Romans moved out, and here we are today, a rich history behind and around us. This particular kitchen finds me at one of my longest serving customers. They are not from Anglo Saxon or Roman times, but from around 20 years ago. The kitchen features on the Traditional Painter Facebook page. 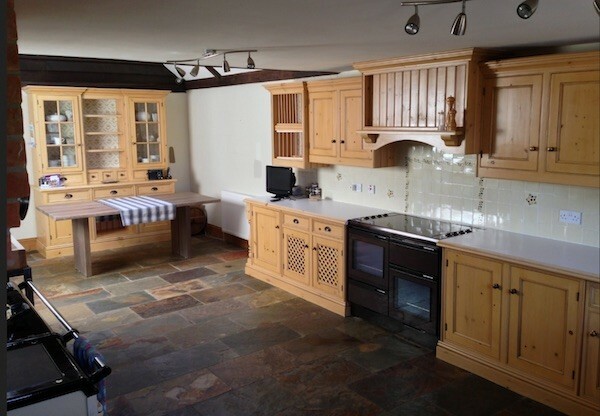 It started life as a bespoke aged knotty pine kitchen. When installed, I had suggested it should be hand painted, but it was wax oiled and gave great service for many years. Eventually though, I did get to hand paint it when I was given the go ahead as part of a refurbishment project. This is what I did. The original finish was a tinted wax oil, which required meticulous preparation before painting. I do all my degreasing work with Fluaxf Pro-Clean and a green scourer. Once diluted to approximately a 10:1 mixture with clean water, the Pro Clean solution seems to remove any and every kitchen residue from every surface to be painted. If you warm the water, the solution removes wax even more effectively, turning the wax into “tea leaves” which brush off. There is quite a bit of information here about Fluxaf products in action, including how I prepared oak varnished windows. The Fluxaf website is here. Once cleaned, the surface is sanded with a Festool dust free extraction system connected to an RTS 400 sander. Using 120 grit and 240 grit abrasive, I create the perfect key for an adhesion primer. The adhesion primer was crucial with this particular kitchen. There were numerous knots on the rails and stiles of every door. Enter Zinsser B.I.N. stain blocking adhesion primer. Once the primer has dried, it’s then sanded flat and the next coat of undercoat primer is applied. By tinting primers to the chosen colour, the final depth of colour is maximised. The primer coats should be solid. Once de-nibbed and cleaned thoroughly with a vacuum and tack rag, the final top coats of water-borne furniture enamel can be applied with confidence. The colours chosen for this project were Becker’s equivalent to Old White and Pigeon for the cabinetry and Lime White for the walls. As you can see from the photographs, the colours enhance and bring new life back to this stunning kitchen. It is one thing to read a case study from the painter’s point of view. It is good to hear what the client really thinks about the service on offer. Richard, FX Decor Ltd has worked on all my interior design projects since 2000 both in England and France. He still continues to do so. He has had a key to my home since then. The ongoing nature of our working relationship is a testiment to his skills; his vast knowledge of painting and decorating products and how they can be used to their full potential; his eye for colour; his project management skills, and his network of other high quality home improvement specialists. He starts a job when he says he will. He never leaves a job unfinished and is a careful, clean worker who is unobtrusive. He is a great guy who has the confidence to say when he believes your ideas won’t achieve what you are seeking. A recent project was a refurbishment of my country style kitchen to something more modern but still in keeping with my home which is a barn. I was dithering with colours, changes to the work surfaces and style of the units. He played a pivotal role in helping me specify my requirements and then delivered them including managing other workers. He had a knack of finding a way to get over the inevitable hurdles that such a project presents. As always I was highly delighted with the finished product. There are plenty more testimonials of Richard’s projects where he has been commissioned to repaint a kitchen. 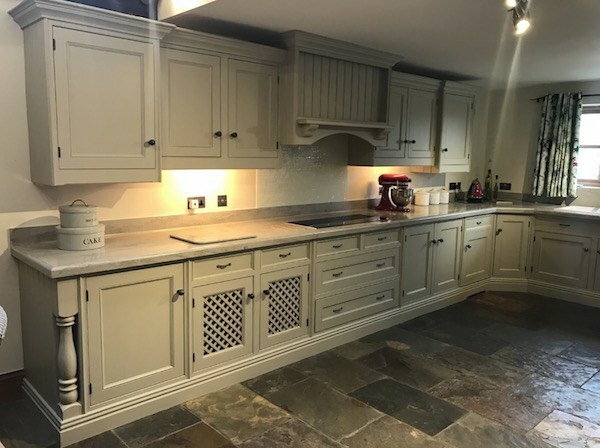 If you are looking at your own kitchen in Shotesham All Saints or anywhere in East Anglia, and wondering how to add some life and pizzazz to it, ask Richard for a free quote. This is his profile page or contact him direct at www.fxdecor.co.uk. Post Script: What did the Romans ever do for modern day painters? Short answer – quite a lot. Although the Romans learnt most of their painting and decorative techniques from the Greeks, they still influence us today. The Cistene Chapel reveals how they treated wall areas with painted stucco (frescos). By applying pigment to wet newly lime plastered surfaces, the two materials bond permanently. According to a well researched autobiography written by Irving Stone, Michelangelo learnt to paint frescos on the job and made some major errors, but he soon got the hang of the techniques. His epic works from 1536 to 1541 still survive. You get a similar bonding effect painting Keim silicate paints onto untreated stone, plaster and concrete surfaces, with examples over 100 years old and holding up well. 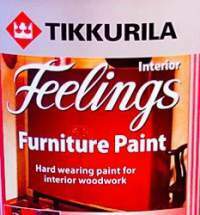 Decorators in the 21st Century will also be well aware of the use of colour and assorted trim work to break up large open spaces. Think dado rails and cornices and architraves in contrasting colours to the walls. Here is a full list of Roman architectural details, some of which will be familiar to painters. The Roman painters had quite a range of colours too, to meet the demands of their clients. And specialist decorators continue to trick the eye with painted trompe l’oeil scenes. Techniques hailing from literally the year dot are still in action today. With the level of communication and open access to knowledge, homeowners, designers and decorators have never had it so good for ideas. In case you haven’t seen it before, here is the sketch.